In a mixer, beat butter and sugars on medium speed until light and fluffy (about 3 – 4 minutes in a stand mixer). Add eggs and vanilla and beat on medium until well combined. Sift together flour, baking soda, baking powder, salt, cinnamon, nutmeg and ginger; whisk to combine. Gradually add flour mixture to butter mixture; mix on low until just combined. Do not overmix! 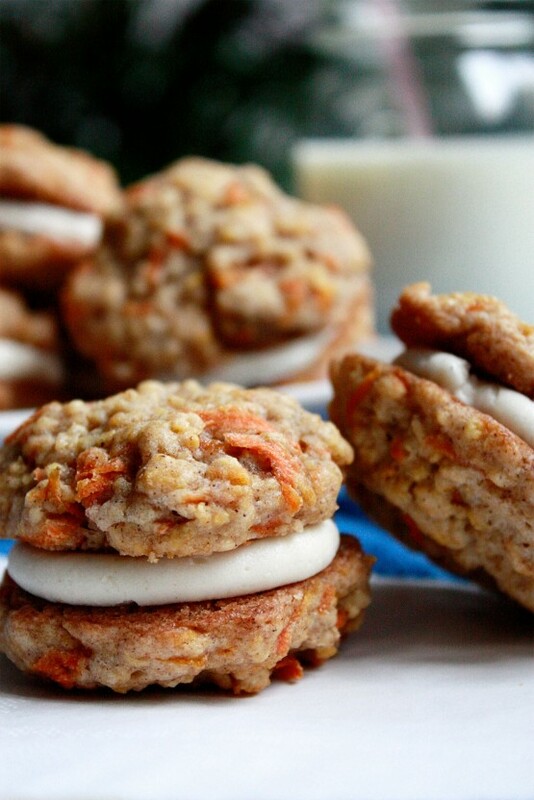 Mix in oats, carrots, raisins (if using) and walnuts. Chill dough for at least 1 hour. Shape tablespoons of dough into balls and place on prepared baking sheets, spacing 2 inches apart. I flattened mine a bit and sprinkled a bit of sugar on the tops before putting in the oven. Bake until browned and crisp around the edges, 12 to 15 minutes (mine took 11 minutes so check early) rotating halfway through. Transfer to a wire rack to cool completely. While mixing at a low speed, add sugar.Once combined, add a splash of vanilla extract. Mix on a medium to high speed for 3 minutes, or until smooth and fully combined. Frost and enjoy! Thats what I’m talking about! Happy fall y’all!